San Francisco Public Defender Jeff Adachi on Wednesday summed up his thoughts on his city police department’s use-of-force policies as being stuck in the 19th century. "The idea to allow officers to use whatever force they want to is not in tune with what’s happening around the nation," Adachi said. His office hosted the 13th Justice Summit Wednesday morning at the San Francisco Main Library with Melissa Harris-Perry, a former MSNBC anchor and social scientist, headlining as the keynote speaker. Former Boston-area homicide inspector, Ken Williams, who now works as a use-of-force and wrongful death expert, also spoke. 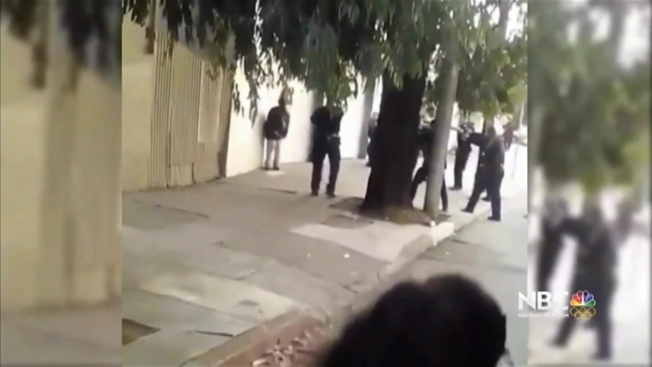 Williams said he reviewed city records and videos from the Mario Woods shooting to pinpoint any possible failure points in the San Francisco Police Department's use-of-force policy. Police shot Woods, who is accused of stabbing someone, more than 20 times in December 2015. According to Williams, the police department need more specific de-escalation directives for officers, not just the law that allows police to use deadly force to protect their lives and the lives of others. He also pointed to a part of one video that showed an officer and Woods walking toward each other, closing the safety distance and increasing the chances for the use of deadly force. "If the SFPD policy is put into question, does it allow for de-escalation or simply say police are authorized to escalate all the way to use of deadly force and not take any other precautions?" Williams asked. He also suggested policies like directing officers not to rush into situations with suspects armed with knives and maybe even using shields as a protective measure. "That way it affords people better protections, that way we don’t have overzealous policing, that way we don’t have discrimination in policing, we don’t have bias in policing," Williams stressed. "That has to be something addressed in those SFPD policies." Later in the afternoon, the summit will host a panel discussing use of less-than-lethal force like Tasers, which city police officers do not currently use. Part of the panel includes Steve Tuttle, a founder of Taser International, San Francisco Police Commissioner Petra DeJesus, and Stanford University researcher Akiva Freidlin.